Testimonials – The Alinker Inventions Ltd.
We've created this space for your stories of joy, freedom and independence from around the world. Thank you for sharing! Please feel welcome to send your own story to info@thealinker.com so that we can share your Alinker experience to inspire others and for everyone to see and learn from, as we work together towards building a more inclusive community for all! “I took the Alinker to the Metropolitan Museum in NYC today. When I saw this painting of Oedipus and the Sphinx by Moreau, I knew I had to take a picture. Let's update the riddle: What goes on four wheels in the morning- baby carriage, two wheels at noon- bicycle and three wheels in the evening- we know that answer!" “I went outside for lunch at work, twice this past week. I avoided this for the past year because the memory of how hard concrete is to fall on, is still fresh in my mind. In the past, my right wrist would begin to hurt using my pole, a residual pain from the fall on concrete last year. I had to pause if I needed to make eye contact. Now with the Alinker I can whiz down the hallway, easily make eye contact again and I seem to have permanent smile on my face. My brain feels so relieved not having to stress so much about tripping and falling. I love that with just two weeks of using the Alinker consistently I feel it is a natural extension of my daily life and I feel so secure using it. With the Alinker my world has expanded greatly. Gosh I feel like I am 5 years old again! I can’t imagine living my life without the Alinker." "Being an Alinker Ambassador for The United States will allow me to introduce an alternative to amputees. The comfortability and design of the Alinker make it easy for me to walk while exercising my leg. I'm looking forward to creating positive influence and impact with the brand. I was introduced to the Alinker at my Bezgraniz Couture fashion show at L.A. Fashion Week in October 2016. — Jerris Madison (44) Los Angeles, California, USA. Photographer. Influencer. Editor in Chief of OBVIOUS Magazine. #250KChallenge Competitor. Brand Ambassador for The Alinker Inventions Ltd.
"I wasn’t able to go out on my usual walks for the past 4 years because of severe back aches that makes it very difficult to walk without pain. Now I am out and about. We went to a park at Lake Ontario yesterday and I rode the trails for 4 miles. It was just wonderful. By the way, I am 70 years old. Much too young to just sit around!" “He is loving it, Leon, and is going off on his own to our local mail boxes - once around the block. It is giving him a freedom that he has not had in [a] while, and I feel very comfortable being able to let him go out on his own without worrying that his legs might give out. He can certainly get some pretty good speed going, to the effect that I have to speed walk or jog in order to keep up with him. It has been a very long time since he was faster than I am. “I will take a couple of pics or video clip and get him to share his experience with you. I know that he would be happy to do so. People in our neighborhood think it is a very cool 'walking bike' and can see how much he enjoys using it. "Oh Graeme, it's wonderful to see you going out on your own, not only with a smile on your face; but also, providing me with the feeling that you ARE going to return without falling, having difficulty… just to see you doing something where you don't need others and I justifiably feel you are safe." “I am an ability crusader, a blogger, a model and a designer. I’m passionate about universal design and inclusion. I live with a spinal cord injury and use a cane and manual wheelchair for mobility every day.” “I am currently working on my walking canes, have an inclusive dance class, am an ambassador for an inclusive media organization, am involved with Spinal Cord Injuries Australia, and on the Access committee for my local council... I have several other things in the works BUT I always have time for more. My passion for universal design and inclusion developed out of necessity. When a spinal cord stroke left me with incomplete paralysis, I suddenly found myself in an environment and a society that were no longer built for me. After years of exerting energy on trying to adapt, I decided to educate the world on my needs and wants with the hope that maybe something would change. “I noticed that my dad used his feet to move around in his wheelchair in the apartment. 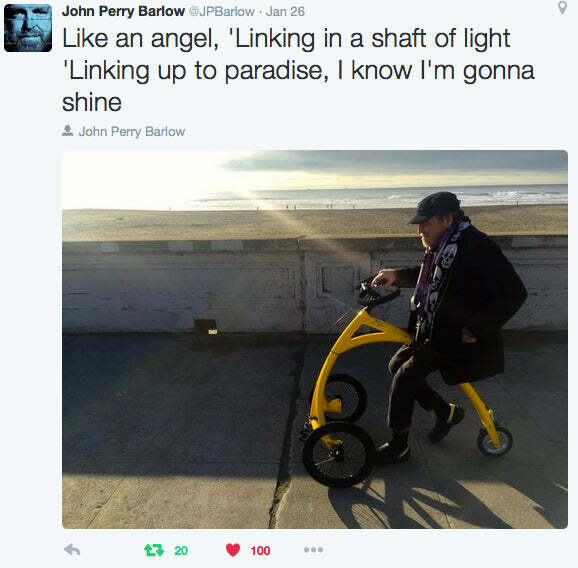 That is what gave me the idea he might enjoy the Alinker. After some initial hesitance about the Alinker, my dad has become very eager. The joy of feeling the movement reminds him of his younger age when he was an enthusiastic biker. With the walking aid, we were down to about 300-400 meters a day. The first time with the Alinker, he covered about 1km. A week later, he is already up to nearly 2km. My dad stopped travelling at age of 90 because he thought he was too old. This is him on his spring trip to Budapest shortly after his 96th birthday. We are looking forward to going back with the Alinker soon."